Details on croton plant care and how to grow crotons in pots, indoors and outdoors growing from cuttings and other propagation techniques such as growing crotons in water and by air layering methods are described. Crotons (Scientific name: Codiaeum variegatum) are very popular ornamental house plants in tropical and subtropical climates because of their brilliant leaves in red, yellow, green, purple, orange and mixed colour all year round. The crotons are very low maintenance plants. Crotons are cultivated in the Indian subcontinent, South East Asia, New Guinea and the Pacific Islands and also a native of Australian. There are 400 registered cultivars or varieties of crotons . Some of the popular varieties of crotons are America, Angel Wings, Andreanum, Angel Wings, Arrowhead, Captain Kidd, Caribbean Star, Danny Boy, Danny Boy, Dark Ruler, Eye, Franklin Roosevelt Glen Roof, Headdress, Indian Rina, Irene Kingsley, Kentucky, Mona Lisa, Mrs Iceton, Nestor, Norma, Punctatum, Red Rheedii, Sanderi, Shirley Temple, Super Petra, The Ramshorn, Tiger, Twist and Point, Undulatum (Piecrust ), Undulatum, Vera, Sanderi, Yellow Mrs Iceton, etc. New croton varieties can be producing by applying pollen from one outstanding croton to another. The croton plant can grow 3 to 8 feet high with a spread of up to 6 feet. In extremely favorable conditions, it can even reach up to 12 feet. Crotons plants are grown as an indoor or outdoor plants in indirect sunlight in most climates. 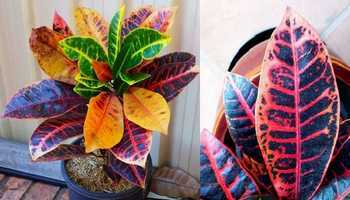 Too much sunlight bleaches the colors of the leaves, actually many croton cultivers prefer, light shade partial shade. However, many crotons cultivars can grow best in full sun. I have propagated crotons of many colors and now they are growing in pots producing colorful displays indoors and outdoors. Multiplication of crotons is quite easy by stem cutting or air layering. A new croton plant can be grown by taking a tip cutting and putting it in soil or water to root. They can also be grown from seeds. How to take Croton Cuttings? You can take cuttings for propagation at any time during the growing season. Following is a step-by-step guide on growing crotons from cuttings. Cut a stem of 5-6 inch length (pencil size) at 45-degree angle from an actively growing healthy and mature croton bush using a pair of clean, sharp pruning shears. The croton cutting should have at least three sets of leaves at the top. The cut should be just below a leaf joint. Remove all the leaves at the bottom and cut all the top leaves into half or less. Take a small pot and fill it with equal part of river sand and and peat moss or vermiculite. If you don't have peat moss or vermiculite, you can try a mix of river sand and potting mix. Water well and keep aside for an hour to drain out the excess water. Dip the cut end of the cutting in a natural rooting hormone. You can skip this step if you don't have a rooting hormone. The rooting hormone quickens the root formation and increases the success rate. Make a hole with a pencil in the soil in the pot and insert the cutting into the soil. You can put 3-4 cuttings in different holes in the same pot. Cover the pot with plastic to create a greenhouse atmosphere. I put the pot in a polythene bag and tie it at the top to contain the moisture. Place the pot in shade where temperature is at 20-25°C. Open the bag after 5-7 days and see if the pot needs water, mist the soil if it begins to dry. Over watering will rot the cutting. Daily watering is not needed as there are no roots as yet. Croton cuttings take about 4 weeks to develop new roots and new leaves start to emerge. Remove the pot from the bag and place it in shade for another 8-10 weeks. Transplant he rooted croton cuttings in bigger pots filled with a soil mix as above. Place the new croton plant in partly shaded place or filtered sunlight. Propagating croton plant in water is very easy, as easy as taking a cutting and putting it in water. Take a cutting 6 to 12 inch long and as thick as a pencil from the top of the plant. Cut the lower leaves leaving the growing tips intact. Place the cuttings in a pot of water at about 20-25°C. Keep the pot in shade indoors or outdoors. Roots will form in about 5-6 weeks when you can transplant the cutting in a pot filled with a soil mix containing equal parts of compost, manure and river sand. In this method of propagation technique, the stem is rooted while it is still attached to the plant. take a branch which is in indirect sun light. Make a diagonal cut through one-half the diameter of the stem and insert a toothpick in the cut to keep it opened. Apply some rooting hormone on the wound. Cover the cut area with damp sphagnum moss and wrap with a polythene to keep the moisture inside. If the sphagnum moss turns to a tan color, it means that it is becoming dry. Temporarily remove the covering, mist the moss and wrap it again. After a few weeks, the stem will develop roots and new growth will start. Cut the branch and plant the new rooted branch in a pot filled with soil. Once you try these techniques of growing crotons, you will be thrilled to produce new plants successfully. Healthy croton plants are almost free from pests and diseases. The pests like white fly, mealy bug and fruit spotting bug may sometime be problem. These can be prevented or treated by spray of neem spray, garlic spray or pest oil. Thank you for sharing these propagation instructions! Where I live Crotons are sold only as a houseplant — and a somewhat costly one at that. That, however, didn't stop me from trying. That's when I discovered not all Crotons are created equally. After many failed attempts in which Crotons would not survive the winter, I stumbled across one in late Fall about eight years ago that was sitting neglected at the nursery under a bench in cold weather, yet seemingly none the worse for it. Thinking that the plant seemed particularly hardy to be alive in an outdoor setting at that time of year, I bought it. Not only has it continued to thrive as an outdoor plant (potted and positioned in filtered sun beneath a Mulberry tree) but it has become enormous. Unlike other Crotons I kept as a houseplant, it also never lost the lower leaves so it is a full, vibrant and hardy year around. Recently, thanks to this website, I was able to get a cutting to grow off of it using the water method. I expect that because the cutting came from a particularly hardy plant that it will also thrive outdoors. Of course I would not subject this type of plant to a true Winter freeze but 99.9 percent of the Crotons I have owned over the past 10 years failed to survive even a mildly cold winter outdoors. The effort to find one that wouldn't was well worth it, however, as I now have a spectacular Croton that provides color to my yard all year long.